I will be wearing the Saucony Mirage 5 running shoes with Lace Locks for the 2016 New York City Marathon! I've been wearing the Mirage model for the past 2 1/2 years. As I got more efficient with my running, I focused on landing mid foot. The lower heal to toe height is 4mm help with this landing. Unlike my Previous shoes, the Asics Kayano that has a 12 mm height. I would land on my heels which caused more problems to my hips and knees. For me as I focused on landing more midfoot, I started to have calve tightness, and the knee issues disappeared. But I think the calf issues were cause because I tried to transition to midfoot too fast in the beginning. Now that I am use to it, I am running the strongest ever. The bungee material in the Lace Locks stretches the right amount for my feet without feeling too loose or too tight! And I don't have to double knot my laces. 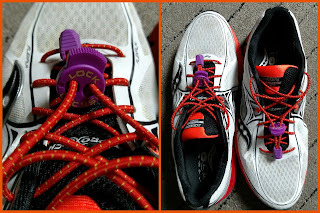 I started to wear Quick Laces for a quicker transition times in my triathlons. Will You Run with the Dark Side of the Force? Warm Yourself with the Force!